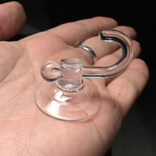 Small suction cup hooks. 30mm diameter, Thicken. 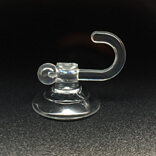 Plastic small suction cup hooks use a basic principle to achieve a high amount of functionality. This product range uses adsorption to stick to any surface. In layman terms, it creates a small amount of vacuum to attach and detach itself to any surface. The only condition it requires is that the surface be smooth at all times. This product range finds a number of applications in our daily lives. Most of these products are made from clear plastic in order to keep them light, small and flexible. These products can be purchased in bulk by anyone. It has implications in both commercial and residential projects across the globe. KingFar as a company leads the product range when it comes to innovation. They understood that quality will always triumph quality at all times. They started using innovative materials like Silicone and medical grade plastic. This ensured that features never before seen were introduced into the market. We are referring to fire resistance, temperature resistance and even resistance to high volume loads. This makes product ranges like small suction cup hooks beat industry benchmarks with relevant ease. High end materials like silicone, PVC etc are added to clear plastic to enhance the qualities. Works in both below zero degrees and as high as 80 degrees. Suction Cup KF-30BH-B2 can handle loads as high as five kilograms. 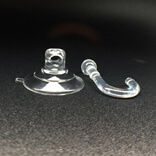 The addition of plastic hooks to the suction cup makes it versatile and extremely strong. The heat resistance of the materials used serves its purpose to a T when it comes to being deployed under different circumstances..